Join a bunch of lovable insects that will warm your heart with this cartoon themed online casino video slot from 1×2 Gaming. Crazy Bugs is playable both on mobile and on desktop, for as little as 20 coins. The characters will keep you entertained, while the 5 reels and 3 rows spin to reveal any of the 20 non-fixed paylines. 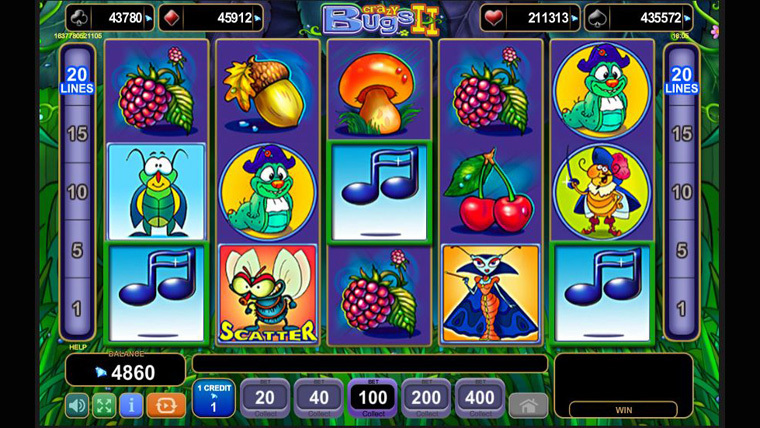 Various insects like crickets, flies and butterflies will reveal features like Cricket’s Party level, Free Spins and a Progressive Jackpot. The RTP is 95.78% and the variance is medium-low, making this slot a delight both in terms of prizes and gameplay. Butterfly Queen Wild – replaces all other cards, except the Scatter and Bonus Note. All prizes won using the wild are doubled. Housefly Scatter – 3 such cards trigger a level where you pick a symbol and reveal a prize, that goes as high as 3000 coins. Bonus Note – land 3 on reels 1, 3 and 5 to trigger the Cricket’s Party feature. Here you first choose a note, which grants between 8 and 15 free spins. Then you pick a cricket, which awards a multiplier of up to 4x. Progressive Jackpot – a Jackpot Cards game is triggered at random. From a set of 12 face-down cards, choose 3 identical ones to find out which of the Jackpots you have won. Gamble feature – after each winning spin you can either choose to cash in or double your prize. If you want the latter, all you have to do is guess the colour of the next card.